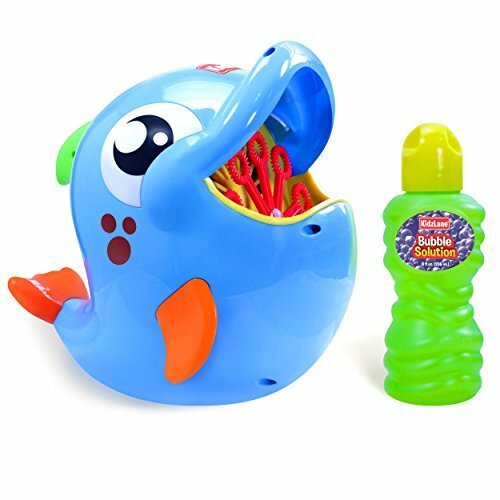 KID-FRIENDLY DESIGN Fun, bright Dolphin shape will delight kids of all ages as they watch loads of exciting bubbles pour out of its mouth in a continuous stream! Simple and easy for kids to operate and refill. 8 OZ BUBBLE SOLUTION INCLUDED. AMAZING OUTPUT Get ready for a bigger, better bubble bonanza! A QUIET YET POWERFUL MOTOR and 10 spinning wands pour out more than 500 bubbles/ minute, thrilling kids and pets alike. 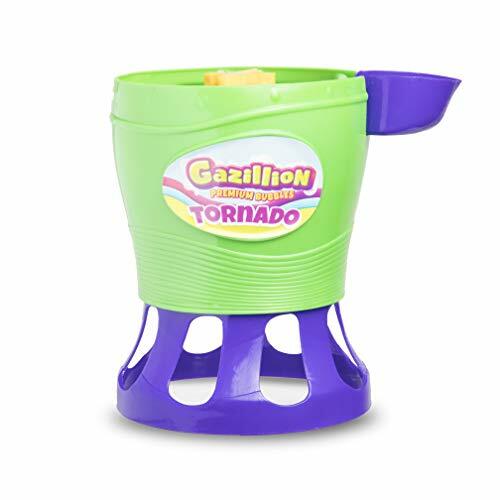 STRONG & DURABLE Made using strong, high quality materials, the Kidzlane bubble blower will prove to be durable and long-lasting - so you can buy it once and enjoy for years. STABLE, BALANCED STRUCTURE This adorable dolphin was designed with a flat, supportive base that will sit securely on most surfaces, thus avoiding unnecessary spills and tip-overs. VERSATILE & DELIGHTFUL Buy this once and you'll never fear the phrase I'm bored! again. Sure to be the hit of any party! Can be used indoors or outdoors. Celebrate birthday parties, playdates, weddings, baby showers, and many more events. The WOWmazing Kit is designed to entertain the entire family in a fun outdoor environment. It contains everything you need to create bubbles that are big, colorful and fun: a set of WOWmazing Wands, a pouch of WOWmazing Bubble Concentrate, and a WOWmazing Bubble Trick Booklet The WOWmazing Wands were designed for children in mind; however they will keep adults captivated all the same! It is made of two lightweight colorful wands firmly connected through an absorbing braided cotton string. This new product design can help develop kids motor skills with engaging healthy outdoor activity. The WOWmazing Bubble Concentrate is used together with WOWmazing Wands. It's the secret to making our bubbles so big and last so long. A single WOWmazing Bubble Concentrate pouch makes at least 1 quart of WOWmazing big bubble solution which will generate hundreds of giant bubble. Just add 1 pouch of WOWmazing Bubble Concentrate to one quart of tap water. It is that easy! The WOWmazing Bubble Trick Booklet includes a variety of tips and tricks that will make giant, high flying and long-lasting bubbles. Passers-by will be sure to say WOW Amazing ! A portion of this product s proceeds goes to support autism research and awareness. UNIMAGINABLY GIANT BUBBLES: this giant bubble wand creates long, giant bubbles thanks to a 2-handle design, which has been used to set every big bubble world record in the last 25 years. Passers-by will be sure to say "WOW... Amazing"! BEST QUALITY GIANT BUBBLE BLOWER: Designed to last for kids and families alike, this big bubble maker is lightweight, durable, colorful outdoor toy for boys and girls that is easy to use even for young preschool children. BUBBLES SOLUTION MADE IN THE USA! The WOWmazing giant bubble concentrate is made right here in America so you can trust you're getting a high-quality, reliable product. 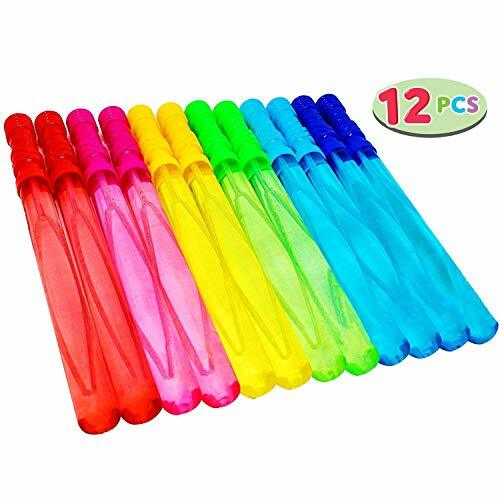 12 Pack colorful Bubble Wands. Good for pool parties, children s birthday, outdoor activities, family reunion, etc.. Joyin Toy bubbles provides great value Fun toy for spring, summertime and bath time activities! Super Value Summer Toy Pack and Party Favors Set. Perfect for Bath Time, a Themed Party, School Activities, Carnivals and more! VARIETY. Each 12-pack contains 2 Yellow, 2 Blue, 2 Pink, 2 Green, 2 Orange, 2 Turquoise color 14'', 4 oz Big Bubble Wands. GREAT FOR EASTER. A popular choice for Easter basket stuffers. ENDLESS BUBBLES. Lots of bubbles come out when you wave around or blow on the wand. SAFE. Solution passes all safety tests (TRA, USP51, USP61). Very safe on kids' skin and face. 1byone improved drain design Bubble machine new design for easy carrying especially for kids; it can be powered by both plug in or batteries when kids playing outside; the drain design at the bottom to protect the bubble machine. 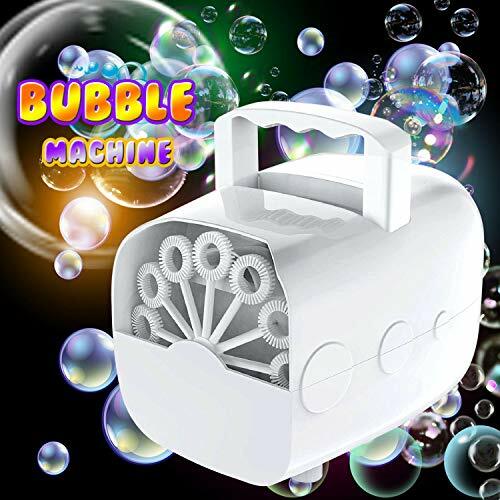 A great complement for any gathering, 1byone bubble machine can be used both indoors and outdoors and is perfect for birthdays, holiday parties, picnics, BBQs, weddings, family get-together and so much more. Let's play and dance in a bubble world together! Easy to use: step 1: pour bubble liquid into the reservoir; step 2: plug the power cord into a grounded electrical outlet or insert 6pcs of c-battery; (note that battery power will produce less bubbles than outlet power using the AC adapter. )Step 3: turn the power switch to the &liquor; 1or &liquor; 2 position to start the bubble machine. Specifications: AC adapter voltage: 100-240V, 50-60hzrated power: 13.5wBatteries: 6 x c Type output: 9V 1.5Asize: 66.9(L)x82.7(W)x66.9(H) inches/170x210x170mmWeight: 2.29lbs/1.04Kgmax tank capacity: 12.8oz/380Mlpackage includes: 1 x bubble Machine1 x Power adapter1 x instruction manual tips: keep the bubble machine level when filled with bubble liquid; please always drain and dry The reservoir before transporting this machine; operating this machine without liquid will cause damage to the pump; do not use on a rainy day and keep away from water as it may cause a short circuit. Thrilling for kids and pets alike! A perfect gift that's hours of fun for the entire family and will put a smile on every kid's face! Also great for creating atmosphere at gatherings such as weddings, parades, parties, birthdays and any other activities you are hosting. High-Quality Materials. Made from durable ABS thermoplastic polymer for superior toughness and rust protection.With official CPSIA ASTM F963 consumer toy certification. Simple for any kid to operate. Ready, aim, and fire a barrage of bubbles! Let the children have fun and help them learn something new at the same time! The Haktoys Jurassic Dinosaur Bubble Shooter is a smart and practical purchase for kids, and sprays out buckets of awesome, multi-colored bubbles to flashing lights to ensure plenty of fun! Product dimensions: 8.3 x 8.7 x 2.5, Package dimensions: 10.3 x 10.3 x 2.5 inches, Weight: 13 ounces. Bubbles are safe, non-toxic, and non-staining. New version no longer comes with 'ROAR' sound. Make sure to remove the battery protection strip underneath the battery compartment. Bubbles will begin shooting in several seconds once you pull and hold the trigger. Hold the bubble shooter upright as much as possible when using. Bubble solution may leak when tilted. Lights up but does not blow bubbles? Try replacing the batteries. Use of good-quality brand-new batteries are recommended. Before storing, remove the bubble solution and batteries from the bubble gun. Allowing a short break during the play helps prevent motor failure due to overheating. HAK Toys stands by every product it offers, and it would never offer a product that does not pass HAK Toys' strict quality measurements. This means that HAK Toys' quality is top-notch. If the product does not meet your expectations, we will make it right - guaranteed! 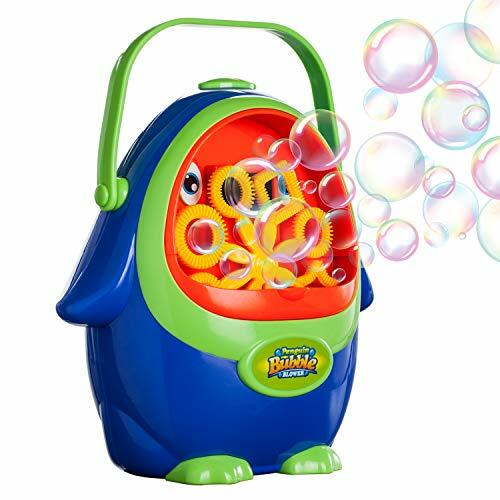 The Maxx Bubbles Bubble-N-Go Bubble Mower by Sunny Days Entertainment is a fun mower for kids work like mom or dad. This is hands down the best bubble mower on the market with no batteries required. The mower has mechanical gear sounds for more realistic play. Simply push the mower and have fun making bubbles fly. 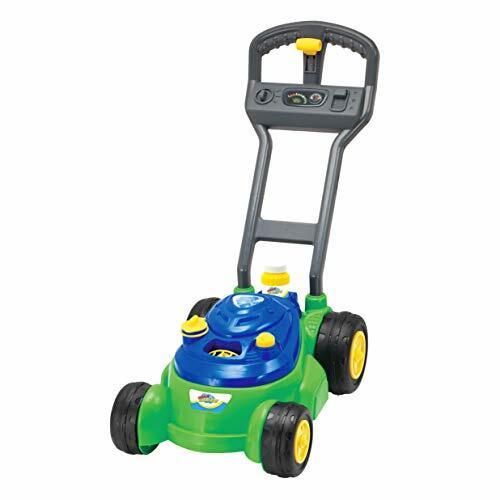 Kids will have fun walking pushing the Bubble-N- Go mower which features fun mechanical sounds and bubble maker. Ready, aim, and fire a barrage of bubbles! Let the children have fun and help them learn something new at the same time! The Haktoys Regular Bubble Shooter is a smart and practical purchase for kids, and sprays out buckets of awesome, multicolored bubbles to flashing lights to ensure plenty of fun! Specifications and Features: Product dimensions: 6.5 x 6.5 x 2 inches; Package dimensions: 11 x 8.5 x 2.5 inches, Weight: 11 oz. Bright and colorful LED Lights, Superior Quality, Attractive and durable Newly upgraded design helps prevent drips! Materials made in line with international health & safety standards For ages 3+ Tips & Care Information Make sure to remove the battery protection strip underneath the battery compartment. Bubbles will begin shooting in several seconds once you pull and hold the trigger. Hold the bubble shooter upright as much as possible when using. Bubble solution may leak when tilted. Lights up but does not blow bubbles? Try replacing the batteries with new ones. Use of good-quality brand-new batteries are recommended. Before storing, please remove the bubble solution and batteries from the bubble gun. Allowing a short break during the play helps prevent motor failure due to overheating. Adult supervision is recommended. Additional bubble solutions can be purchased at ASIN: B00U2P3E5G or B0731QJHSY (search these in Amazon search bar) Package Contents 1 x Haktoys 1700G Bubble Blower 2 x Bubble solution 3 x 1.5V AA size batteries (Included) Why HAK Toys? HAK Toys stands by every product it offers, and it would never offer a product that does not pass HAK Toys' strict quality measurements. This means that HAK Toys' quality is top-notch. If the product does not meet your expectations, we will make it right - guaranteed! Fire a barrage of bubbles and have endless bubble fun - at an affordable price! Parent-friendly and sound-free. Child-friendly and non-toxic bubbles. Super Easy To Use----Get tired of blowing bubbles by yourself? Why not choose an automatic bubble machine? To use our bubble blower, you just need to install four batteries and pour some bubble solution, then press the button, lots of bubbles will come out. Lovely Penguin Shape----With adorable penguin shape, Vtopmart bubble maker is different from many other bubble machines on the market. If you want to send a special gift to your children and brings them more fun, our bubble machine is definitely the right choice for you. Portable Design----Made from high-quality material, the bubble blower is durable and lightweight. 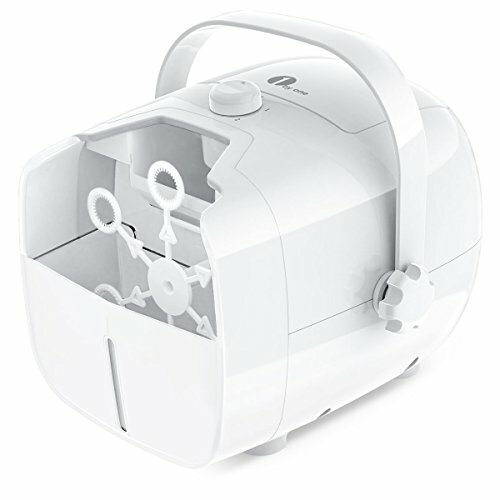 An adjustable handle makes it convenient for you to bring bubble machine to anywhere you want. Perfect for outdoor and indoor activities including kids parties, weddings, vacation and more. Lower Noise Electronic Motor----Have a lower noise electronic motor, our bubble maker can create thousands of bubbles very quickly. In the meantime, no more worries about loud noise when making bubbles, as you will just hear the lower noise. Extra Bubble Solution and Screwdriver ----To make you use our bubble blower more easily, we will send you 5 packs of bubble concentrate solution and a mini screwdriver. If you didn't find them in your package, please contact us. We will solve it for you within 24 hours. Kids will have fun blowing bubbles with the play day bubble leaf blower. The battery-operated toy leaf blower makes a realistic mechanical sound. Create a continuous stream of bubbles while the trigger is depressed. KiddosLand is an emerging brand devoting to producing safe, helpful and fashionable toys. We committed to bring kids an unforgettable childhood with a lot of fun. Your experience and satisfaction help us to improve our service at all times. High Output: A quiet yet powerful motor and 15 spinning wands pour out more than 1500 bubbles per minute, thrilling kids and pets alike. Easy to Carry and Use: The size of the bubble maker is convenient, lightweight with handle for easy carrying, just top up with bubble solution, switch on and play. Suit for indoor & outdoor, especially when you are playing with a child in a park or a square, it will give your kids a wonderful childhood. Safe and Durable: Made from high quality Non-Toxic ABS plastic for superior toughness, the bubble blower will prove to be durable and long lasting, you can enjoying it for long time. Perfect Gift for Kids: The bubble blower is an easy tool for child fun. The lovely design with bright colors makes a perfect gift for children 3+ years old. 4.turn the power switch to the "ON" to start the machine. 4.Children under 3 year old should play under parents supervision. POWERFUL BUBBLE MAKER--This new updated portable bubble machine can generate over 1500 bubbles per minute by its powerful motor and 15 spinning wands. Ready to burst into the dreamlike bubbles world? PERFECT FOR ALL OCCASIONS--White elegant and noble shape with a flexible l handle on it, the device can produce large amounts of bubbles anywhere, which is a wonderful design for your festivals and birthday parties, stages, weddings, barbecue, ball, etc. WORRILESS MATERIALS--Made of nontoxic and good quality ABS plastic, friendly bubble machine for kids, pets and adults to enjoy it. EASY TO OPERATE--Simply pour a given volume of the bubble solution in front of the bubble machine fan, turn the switch on and wait a moment to let it whirl into action. Add more bubble solution as needed. It's battery operated for 6 AA batteries (Not Included) to make it work. ZERO-RISK AFTER-SALES SERVICE - Your satisfaction is our eternal pursuit. If your product does not perform properly, please contact us for a solution. Any problem about our products will be priority settled. Toysery is an awesome light up dinosaur bubble gun. These are a very popular toy that shoots out bubbles. Features Multiple LED lights that illuminates bubbles coming out. Made out of clear plastic so you can see how the bubbles get made and how the mechanics work. Use over and over again. The bubble shooters get the kids off the couch and out into the yard, promoting healthy exercise and improved hand-eye coordination alongside the fun. 1 Light Up Bubble Gun. Uses LED Lights & illuminates bubbles. Recommended age: For ages 3+. 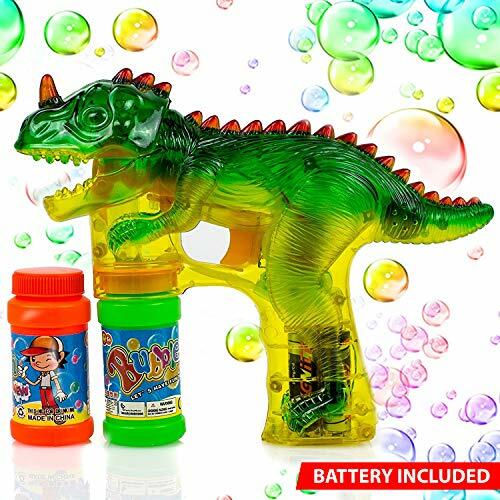 EASY REFILL: The dinosaur bubble shooter guns are easy to refill by attaching a new bubble container to the bottom of the blaster. 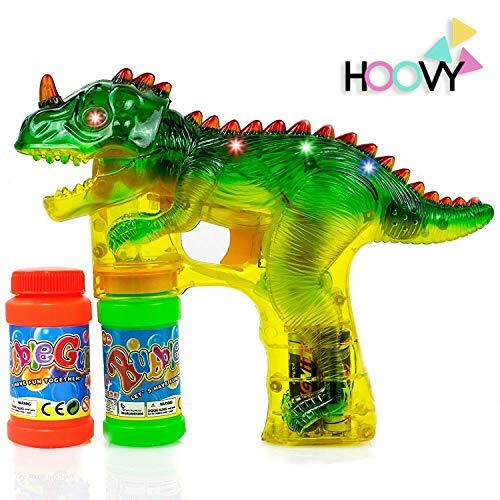 The Dinosaur bubble blaster includes 2 bottles of bubbles and the LED Shooter includes 1 bottle. BAZTOY - GET THE BEST IN QUALITY FROM THE BRAND YOU CAN TRUST! We ensure the complete safety of our toys by conforming to the highest industry standards. We believe that kids come first. Every product we sell has passed a rigorous testing and certification process before landing at your door. 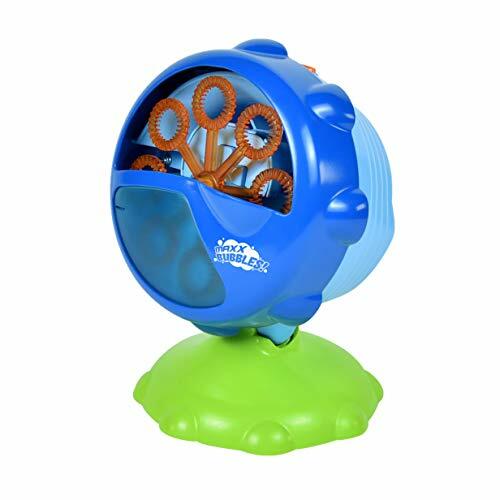 GIFT FOR YOUR CHILD WITH THE PERFECT FROG BUBBLE MACHINE TOY! 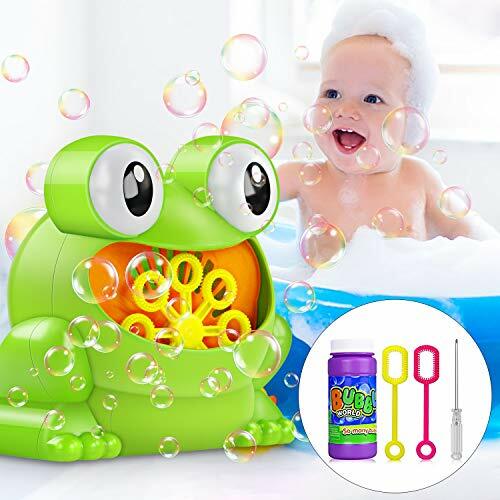 Baztoy Bubble machine with automatic blowing motor and funny frog shape, which is the perfect for parties and weddings, which is also a best summer toys for kids. It can create tons of magic bubbles in the air. Enjoy with your kids and bring wonderful memories to kids. 1.Please do not use the bubble machine in the case of headwinds and windlessness. It may not blow bubbles. 2.Do not pour too much bubble solution, prevent bubble water from leaking out. 4.Clean your hands before eating after using the machine. 5.Children under 4 years should play it with adults' supervision. 6.Please pull out all the batteries and make sure the power of the bubble machine is off before cleaning. High Output: Baztoy frog shape bubble machine is equipped with a powerful fan and 8 bubble wands, which can help it blow out a lot of colorful bubbles automatically. Our bubble blower produces over 500 bubbles per minute, it is the best summer toy for kids. Easy to Operate: Place the bubble machine on a flat surface after installing the battery, then pour the solution into the machine and push the button to pour out many bubbles. After use, you need to drain the water inside and remove the battery(battery is not included in the package). As a Gift: The automatic bubble machine can be used for games, party, stage, wedding, indoor, outdoor and etc. It is the best choice as birthday or Christmas gifts for girls boys and toddlers. Size and Material: The size of the bubble maker is 4.4*4.5*5in. It is made of non-toxic ABS plastic that is absolutely safe for children. The kids-friendly design makes it easy to handle and suitable for most surfaces. 100% SATISFACTION GUARANTEE: Baztoy strongly stands behind each item it designs and sells. Each product is backed with a three-month warranty and 100% Satisfaction Guarantee. FORUP Bubble Machine - The Best Partner of Parties! 1. Pour bubble liquid (not included) into the liquid reservoir. Note that the type of bubble liquid used can affect how many bubbles are made. 2. Plug the power cord into a grounded electrical outlet. Wireless Remote Control:?Switch the power on/off switch to "II" gear, Then the Remote control mode is activated. In this mode. Press Unlock button of the remote controller to generate bubbles. And Press lock button to stop bubble generating. Easy To Use: Simply fill up the reservoir with bubble liquid (not included), plug in the devise, turn it on, and this bubble machine will deliver oodles of bubbles. It can be used in manual or remote control way. Portable Design: The machine is suitable for wherever bubbles are needed. The bubble maker with light weight metal case and handle make it convenient both outdoor and indoor. Our Guarantee: If you have any problem with these products, please contact us, we will try our best to make it right. Notice: Children under 3 years must be played it with adults. Dreamy Atmosphere Creator: The high performance automatic blowing mechanism can create thousands bubbles per minute, to create cheerful, dreamy and romantic atmosphere. Ideal for any occasion: Rainbow bubbles for kids birthday party, family get-together, wedding, dogs & cats and pets playing, stages, Holiday parties, Housewarming, Pool Party, Independence Day, Halloween, Christmas, Thanksgiving Day, Baby Shower, any festivals and much more occasions, Relaxation of body and mind. 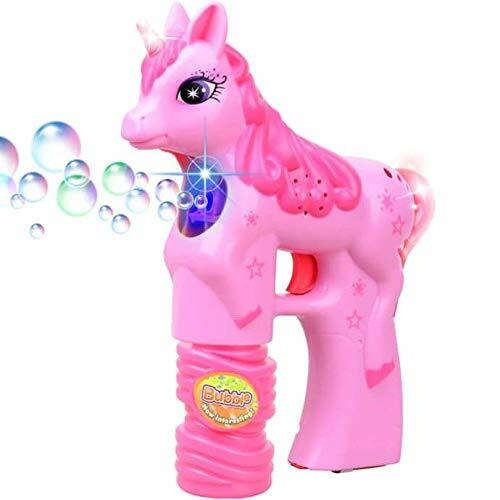 Kids, young and old will love playing with this unique design Unicorn Bubble Gun. Multi-colored bubbles coming out of the bubble gun with flashing lights providing hours of fun, awesome gift for all ages and all occasions. UNICORN BUBBLE GUN. Beautiful design, High Quality materials and eye catchy colors makes the perfect gift for all ages! LED FLASHING LIGHTS. Multiple LED Lights all over! Simply pull and hold the trigger to release the bubbles with flashing lights. BUBBLE REFILLS. 2 x Bubble refills included in the package for more bubbles and endless fun! READY TO USE. 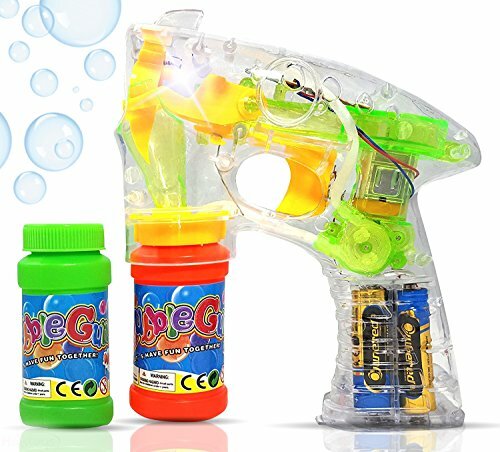 Simply remove the cap of the bubble bottle, screw it to the bottom of the bubble gun and pull the trigger to start playing! Requires 3 x AA Batteries also included in the box! OUR PROMISE: Guaranteed Quality and Satisfaction - Always Free Returns and Exchanges. The Engineering Bubble Shooter Gun is safe, simple, and easy to use. Non Toxic, Professionally made of high quality materials that goes through intensive product safety certification inspection, buy once and enjoy for years. 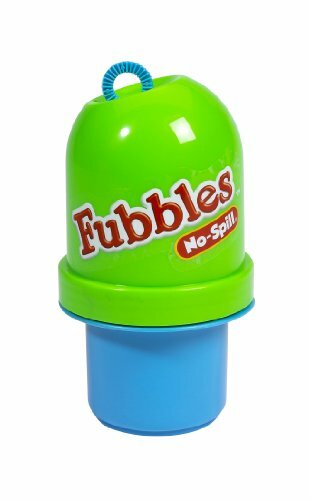 It is a "no mess, no stress" kind of toy so that you won't be worried having your child getting all wet from all the spills that might occur when he plays with it. Pull the trigger to blow a stream of bubbles in different sizes. With Light and sound function, kids will definitely have fun playing with this Engineering Bubble Shooter Gun. With great designs and function, this bubble gun is definitely great gift idea for several occasions. Every kid will surely love the idea of receiving this bubble gun toy as a birthday or Christmas gift and even as a prize, giveaway or party favor used in different kinds of parties. 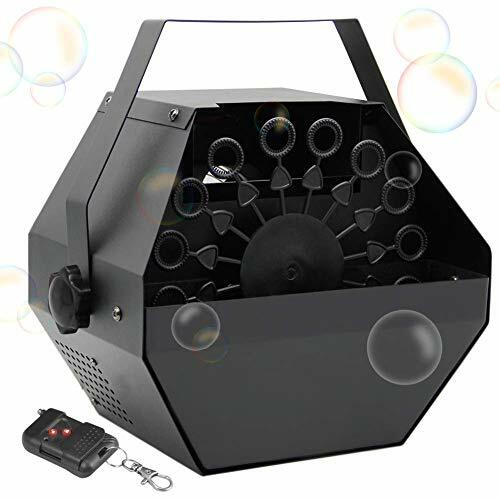 This bubble machine gun is also great for livening up a pool party organized within your household. Enjoy lots of bubble blowing and bursting moments with this bubble gun toy. PREMIUM MATERIAL: Toysery Engineering Bubble Shooter Gun is designed to be environment friendly, non-toxic and easy to use. One set of this Bubble Gun makes a full package of entertainment for the children. ENDLESS FUN: Exciting sound effects, mesmerizing lighting effects and constant stream of colorful bubbles bring endless fun for your Kids. AUTOMATIC BUBBLING: This Kids Bubble Gun can automatically shoot bubbles in an instant. 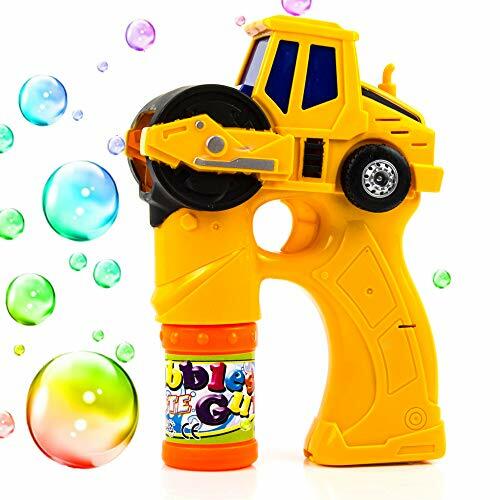 Since the toy is designed as a gun, one press of the trigger will make the machine automatically blow bubbles for you. DEVELOP HAND-EYE COORDINATION: Exciting bubble set encourages kids to get up and enjoy active play while helping to build and improve hand-eye coordination. PERFECT FOR PARTIES: This Bubble Gun Set makes a perfect gift for Rooster themed party, birthdays, Christmas, Halloween, and Pool party. Also great for giveaways, prizes, rewards, and party favors. Get ready for LOTS of fun with this COOL Unicorn Bubble Wand!. Our bubble gun blower is a great inovative alternative to using regular bubble wands for children, the bubbles come out quicker which means more entertainment for the kids and less frustration trying to blow bubbles through a boring wand. 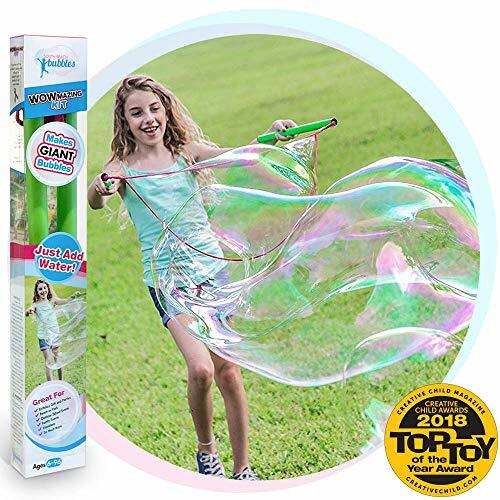 Our bubble gun blower wand not only blows bubbles but creates a stream while blowing them which makes for an exciting bubble show with a trail of bubbles to catch! The amount of fun is endless with this toy, even for the adults! There's more... Our bubble solution is NON Toxic, which means your children will be safe while enjoying their new toy - the bubble blower is made of high quality non toxic and safe materials for your peace of mind Include your friends and family in a fun and exciting match inside the pool, at the beach, and even in your own backyard. After filling the tanks, our water blasters can last up to 20 minutes. Shoot jets of water without having the need to frequently refill for ammo. 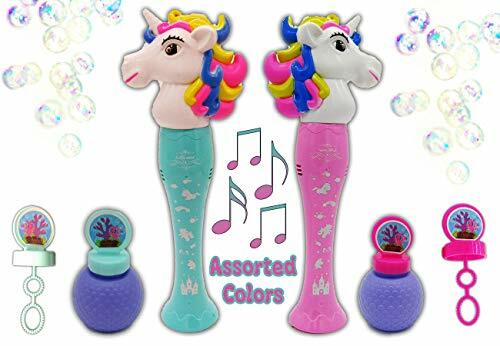 What you get 1 Bubble Unicorn Blower Wand (Batteries Included) 2 bubble solution bottles 100% Satisfaction guarantee! If you are not satisfied with your blower, please contact us and we will assist you promptly! A huge smile on your child's face when they are enjoying this cool bubble blower! This is the perfect summer toy! Make playtime more enjoyable for you and your kids! Grab our Unicorn bubble blowing wand and enjoy the bubble show. Each pack of our unicorn bubble gun blower toy includes a free bottle solution to use with your brand new unicorn bubble gun blower. Easy to use for practically anyone! Just remove the cap from the bubble solution bottle screw into the bubble gun blower, and your new toy is ready for some action! Batteries are included for your convenience. This toy will fascinate from the youngest to oldest of your kids! 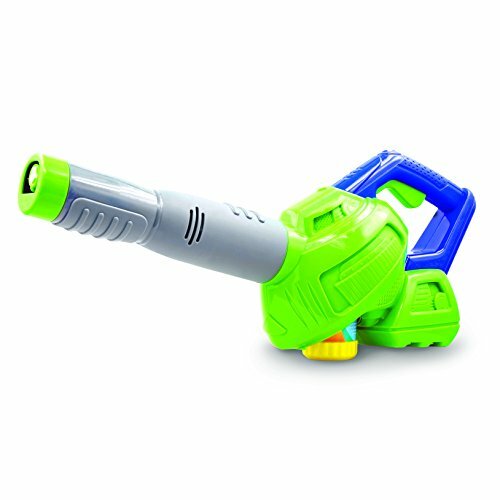 The bubble gun blower can blow more than 2000 bubbles per minute! Get ready for LOTS of fun with this COOL Dinosaur Bubble Gun Blower!. Our bubble gun blower is a great inovative alternative to using regular "bubble wands" for children, the bubbles come out quicker which means more entertainment for the kids and less frustration trying to blow bubbles through a boring wand. Our bubble gun blower not only blows bubbles but creates a stream while blowing them which makes for an exciting bubble show with a trail of bubbles to catch! The amount of fun is endless with this toy, even for the adults! There's more... Our bubble solution is NON Toxic, which means your children will be safe while enjoying their new toy - the bubble blower is made of high quality non toxic and safe materials for your peace of mind Include your friends and family in a fun and exciting match inside the pool, at the beach, and even in your own backyard. After filling the tanks, our water blasters can last up to 20 minutes. Shoot jets of water without having the need to frequently refill for ammo. What you get 1 Bubble Dinosaur Gun Blower (Batteries Included) 2 bubble solution bottles 100% Satisfaction guarantee! If you are not satisfied with your blower, please contact us and we will assist you promptly! A huge smile on your child's face when they are enjoying this cool bubble blower! This is the perfect summer toy! Make playtime more enjoyable for you and your kids! Grab our dinosaur bubble blower and enjoy the bubble show. 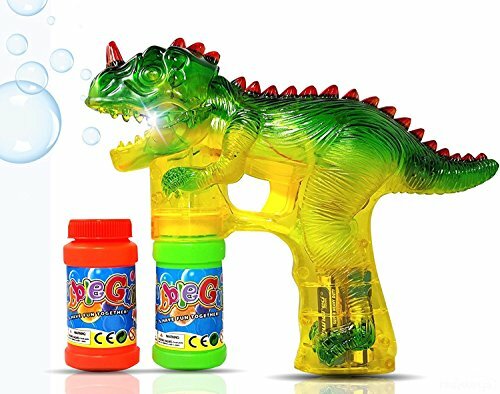 Each pack of our dinosaur bubble gun blower toy includes 2 free bubble solution bottles to use with your brand new dinosaur bubble gun blower. Take the bubble cycle bubble toy out for a spin! 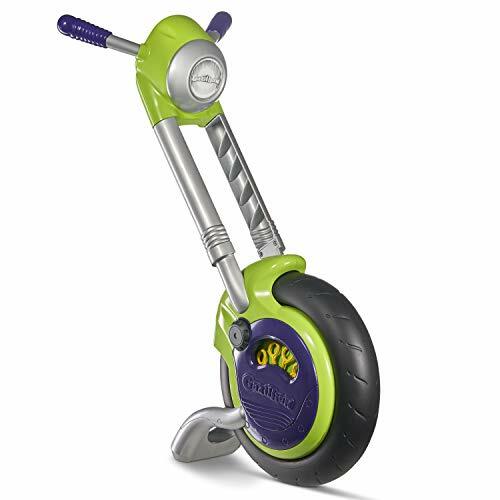 As kids push the Gazillion Bubble cycle bubble toy over the grass, sidewalk or driveway, the motor spins and the engine rolls just like a real motorcycle. With its lightweight design the bubble cycle is easy to push and the no-leak bubble chamber helps prevent those messy spillovers. This is the perfect role-play toy for ages 3 years and up. No batteries required. Includes an 8 oz. Bottle of Gazillion premium bubbles solution. Push the Gazillion Bubble Cycle and the motor spins and the engine rolls just like a real motorcycle! The lightweight design of this bubble toy makes the bubble Cycle Easy to push and the spill-proof Chamber helps to prevent those messy spillovers. This top secret "Super solution" Has been formulated to create the biggest, brightest, most colorful bubbles on earth! 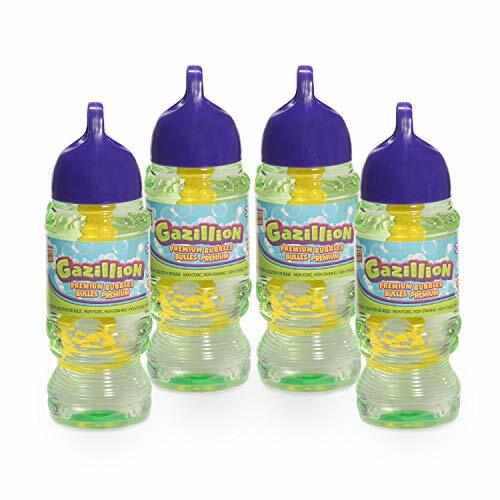 Now in a convenient 4 pack, These 10 Ounce bottles of solution work with any Gazillion Bubbles product. This premium solution is eco-friendly, safe, non-toxic, and will not stain clothing or furniture. With Gazillion Bubbles, you'll run out of breath before you run out of bubbles! Turn your yard into a mystical bubble Wonderland with the light up turbo bubble blower. Adjust the angle to blow bubble in different direction. Keep the party going after the sun sets with the Super bright LED lights for maximum night time fun.